AV Electronics has developed strong relationships with the lifeline of our industry, manufacturers. Our goal is the same, customer satisfaction through teamwork. These relationships attained over time give support to each other through customer relations, parts availability and technical support. Our company meets the service needs of all our manufacturers, and offers fast, quality repair service to our Customers. AV Electronics is Factory Authorized for all major manufacturers. Visit our Service & Support page for diagnostic fees. AV Electronics is based in Tallahassee, Florida with a team of technicians and support staff that provide factory level service and support for all commercial and home electronics. Our technical staff attends regular factory training on new products and each has over fifteen years experience. The roots of AV Electronics started with Yates Radio & TV, a local sales and repair business serving the Tallahassee community since 1951. When George Yates retired in 2002 his employees, Jim Sylvia and Ron Thompson, took over the business and operated it at Yates’ historic location until 2004. In early 2005 the business was moved to its present location at 227 W Carolina St. A name change to AV Electronics was decided upon to better reflect the larger scope of services we wanted to offer our customers. 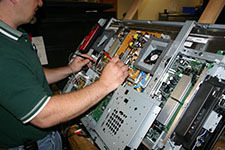 No longer limited to just service and repair on televisions, we expanded to offer sales of refurbished items, service and repair on audio equipment as well as computer monitors. We are constantly searching for better ways to serve our community by exploring new repair services that can be offered for the future. Our primary goal is to provide economic and timely repairs on a full range of consumer audio and video products found in many homes today. 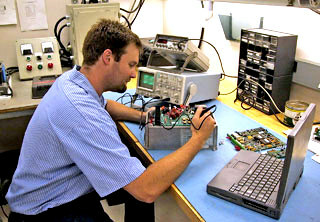 We also provide on a limited basis, repair services on some commercial audio/video equipment. With over 40 years of combined technical experience, our staff of dedicated professionals has the knowledge and expertise necessary to repair and maintain today’s ever changing array of consumer electronics.